More information on the AAS Film Expo can be found in this newsletter. Deadline for submissions is November 30, 2012. Directed by Purnima Shah. 2011. 72 minutes. In Gujarati and English with English subtitles. Reviewed by Gordon R. Thompson. Mother goddess worship pervades the cultures of Gujarati-speaking Western India and the global Gujarati diaspora, reflecting a deep-seated respect for power of fertility and the fundamental importance of the feminine creative force in the South Asian subconscious. No matter how technologically modern or foreign the context, Gujaratis celebrate goddesses with song and dance at weddings and other important lifecycle events, but these performances are particularly elaborate during the nine-night autumnal goddess festival Navaratri. The numerous and diverse communities of Gujarat have articulated unique amalgams of music, choreography, and costume, some of which Purnima Shah documents in this film. 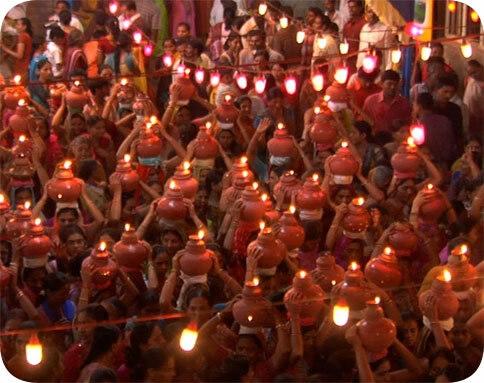 In the words of the narrator, the film provides "a survey of Navaratri performances in different regions of Gujarat." Garbā and rās present the two most important choreomusical forms encountered during Gujarat's Navaratri celebrations. Garbā (a combination of dance and song) offers the most common form of public mother goddess worship, the word deriving from "garbhā" ("womb") and most often represented in performances by a perforated ceramic pot (garbo) with a lamp inside ("garbhā dīpā"), a symbol for the miracle of life. The song texts praise the mother goddesses prevalent in Gujarat, sometimes naming them specifically (or by epithets) and, at other times, broadly referring to them as though a single entity. Directed by Vanessa Warheit 2010. 59 minutes. The Insular Empire is intended to unsettle American viewers' widely-held notions of their country's history as a non-colonial or even counter-colonial power. As the film opens to martial bugle-and-drum music, the voice of the female narrator intones, "As Americans, when we hear the word 'colony,' we think of the British Empire and our fight for independence." In a succession of quick cuts, we see mythic images of the American story: grainy old black-and-white film footage of cannon explosions and soldiers running towards us, carrying the flag of the 13 American colonies; a tightly-framed shot of the Liberty Bell swinging forward, its cast metal word "Liberty" filling the screen; a meeting hall with several dozen men wearing old-fashioned waistcoats and white ascots, signing the American Declaration of Independence with quill pens; and the Statue of Liberty silhouetted against the sky, her torch flaring into flame. The narrator then continues, "But in some parts of America, the word 'colony' has a very different meaning." The grainy black-and-white footage fades and the screen is filled with an image of tropical allure: the prow of a bright yellow wooden outrigger canoe glides over iridescent turquoise lagoon waters. Suddenly the camera takes us underwater, as if to reveal the historical realities beneath the placid surface, and we see the shattered fuselage of a war plane lying on the sandy bottom. 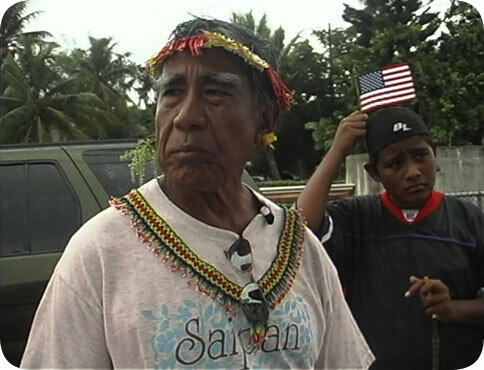 A succession of images follow quickly, telescoping several decades of island history into 30 seconds of film montage: black-and-white footage of a war plane flying overhead, bombs dropping and exploding; brown-skinned Chamorro soldiers marching in dress parade carrying the US flag; young Chamorro girls in school uniforms, marching in front of Government House; Chamorro school children standing inside a classroom and dutifully reading from their English Basic Readers; then a sign in bold black letters declaring "ENGLISH ONLY WILL BE SPOKEN HERE." Directed by Duncan Jepson. 2007. 89 minutes. In Mandarin and English with English subtitles. Reviewed by Robert L. Moore. Follow Your Heart: China's New Youth Movement offers a fascinating look at an emerging trend among China's millennial generation. This trend, which borrows heavily from hip hop and other American youth culture movements, is not yet dominant among young Chinese, but Follow Your Heart offers hints that its day will come - and in the not-too-distant future. The opening scenes of the film, those overlain with the credits, give a brief depiction of China's history, including portraits of the Empress Dowager, street scenes from the turn of the twentieth century, images from the Cultural Revolution of the 1960s and of President Nixon's historic 1972 visit. What these opening images imply is that China has come a long way in the last century or so, a message that serves to emphasize the dramatic departure from the past that the "new youth movement" represents. In fact, this film will be most effective for those viewers who have had at least a brief introduction to some recent Chinese history. A student who understands the intensely collectivized world of China's 1960s, for example, will be much more impressed or even astonished than one who simply sees the new youth movement as another example of hip hop's global reach. The Association for Asian Studies (AAS) annually hosts the premier North American conference of Asia scholars. The AAS conference is devoted to scheduled programs of scholarly papers, roundtable discussions, workshops, and panel sessions on a wide range of issues in research and teaching on Asia, and on Asian affairs in general. Their upcoming conference is scheduled for March 21-24, 2013 at the Manchester Grand Hyatt in San Diego, CA. Since 2011, the Asian Educational Media Service (AEMS), a program of the Center for East Asian and Pacific Studies at the University of Illinois, has organized the AAS Film Expo presented at the conference. Films are projected in a dedicated screening room with a schedule running from Thursday afternoon through Saturday evening. For 2013, we are also planning for an additional "on demand" screening area, allowing greater viewing opportunities for attendees who miss scheduled screening times. For the conference screenings, AEMS is seeking films related to Asia produced by scholars and independent filmmakers. Criteria utilized in the selection process include timeliness, broad appeal to the scholarly community, and examples of new field work. All films presented in the conference will be listed in both the AAS Annual Meeting Program Addendum and in an AAS Film Expo booklet brochure to be distributed at the conference that lists distributors and contact information for each film. Click here to download more information and an application form. AsiaLENS is a series of free public film screenings and lecture / discussion programs -- organized by AEMS in collaboration with the Spurlock Museum -- presenting recent documentary and independent films on issues reflecting contemporary life in Asia. Local and visiting experts introduce the films and lead audiences in post-screening discussions. Digital Asia is funded by the Freeman Foundation of Stowe, VT., New York City and Honolulu and by the IL/IN East Asia National Resource Center funded by U.S. Department of Education Title VI. AEMS invites our supporters to make targeted donations to enhance our holdings and public programs. A donation of $30 can be used to purchase a film for the AEMS library. $300 will sponsor an AsiaLENS screening on campus or in the Champaign-Urbana community. $500 will help underwrite a film and curriculum materials in Digital Asia. Donations for specific materials or events will be acknowledged both in News and Reviews and at sponsored events. Thank you for your ongoing support of AEMS. Follow this link to make an online donation. You will be directed to the CEAPS Giving page. After clicking "Continue With Your Donation" you will find a Special Instructions section where you can highlight "yes" under the question "Do you have other instructions for processing your gift?" In addition to hosting film screenings, AEMS also produces and distributes its own materials under the brand name Media Production Group (MPG) . These are short educational videos and DVDs about an aspect of Asian culture suitable for classroom use and accompanied by curriculum. AEMS maintains a searchable database of over 6,000 films about Asia, including length, format, distributor and synopsis. AEMS library, through its connection to the Lincoln Trails library system, circulates videos and DVDs locally from its collection of more than 2,000.